Read Kathleen Flinn's posts on the Penguin Blog. 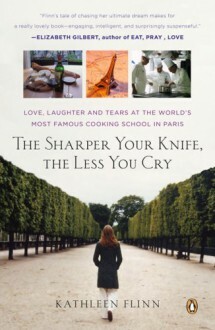 This is the funny and inspiring account of Kathleen Flinn’s struggle in a stew of hot-tempered chefs, competitive classmates, her own “wretchedly inadequate” French, and the basics of French cuisine. Flinn was a thirty-six-year-old middle manager trapped on the corporate ladder—until her boss eliminated her job. So she cashed in her savings and moved to Paris to pursue her lifelong dream of attending the venerable Le Cordon Bleu cooking school. Fans of Julie & Julia and the late Julia Child will be richly rewarded by this vibrant tale of self-discovery, transformation, and ultimately love. Skip it - read Julia Child's My Life In France. This was lacking something....salt? A good read for anyone considering going to Le Cordon Bleu. Flinn's narration can be a bit tiresome and too 'journalistic' but you find yourself cheering for her and her wonderful boyfriend Mike. Fun, easygoing foodie lit, reaffirming the fact that French cuisine puzzles me. And that I want to get my own entry into foodie chick lit... though I don't think I've done or cooked anything to write about. Yet.